What we call "Hebeloma sinapizans" in North America is probably not the true Hebeloma sinapizans of Europe, first described from France by Paulet (1793), but it is similar in many details, including the large stature and the thick, scaly stem. Our species--or species group--associates with hardwoods or conifers across the continent and, like the European species, smells strongly of radish. 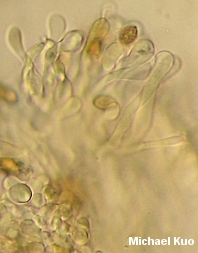 However, its cap is darker than the cap of its European counterpart, and its cheilocystidia are not at all like those of the European species. In areas where aspen occurs, Hebeloma sinapizans should be compared with Hebeloma insigne, which has a pungent but not radishlike odor and, when in the button stage, a very ephemeral cortina. Ecology: Mycorrhizal with hardwoods or conifers; growing gregariously or in loose clusters, sometimes in arcs or fairy rings, in grassy areas at woods' edges or in woods; late summer and fall (winter and spring in California); widely distributed in North America. Cap: 4-15 cm; convex or broadly convex, becoming flat; sticky when fresh; bald; with a soft, cottony margin when young; sometimes with a whitish sheen when young; cinnamon tan to darker reddish brown. 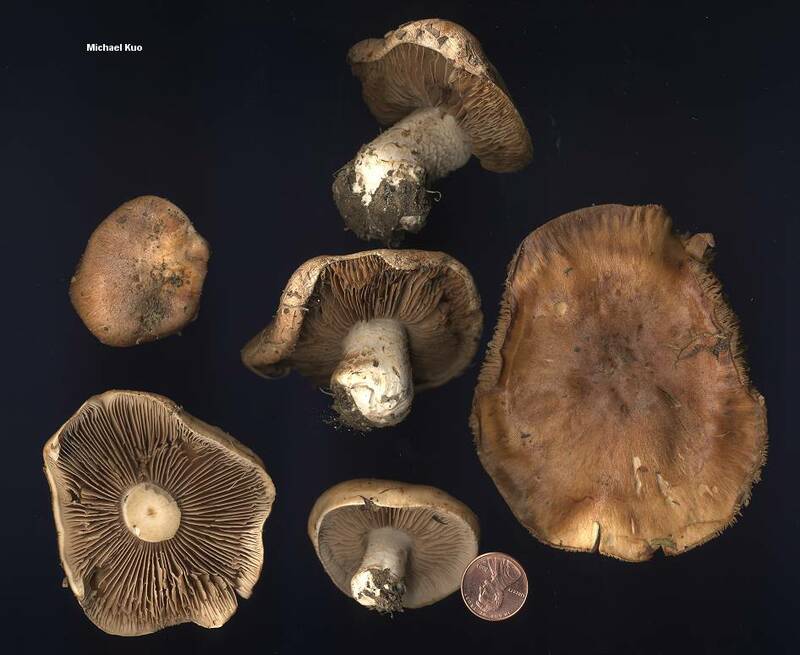 Gills: Attached to the stem, often by a notch; close; pale clay color when young, becoming cinnamon brown to brown; sometimes with beads of liquid when young and fresh; the edges often becoming ragged as the mushroom matures. 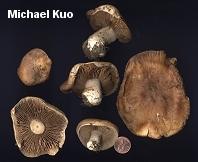 Stem: 4-12 cm long; 1-3 cm thick; more or less equal above a fairly abrupt, swollen base; finely mealy or dusty near the apex; developing scales below, often in more or less concentric bands; whitish, but the scales often capturing spores as the mushroom matures and thus becoming brownish; without a cortina or a ring zone. Chemical Reactions: KOH gray on cap surface. Spore Print: Brown to pinkish brown. 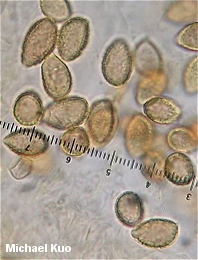 Microscopic Features: Spores 11-15 x 6.5-8 µ; sublimoniform, with a snout-like end; finely verrucose; rarely with a loosening perispore; moderately dextrinoid. Cheilocystidia 33-80 x 6-10 µ; abundant; clavate, subcapitate, or sometimes merely cylindric--but almost never ventricose. Pileipellis an ixotrichoderm in young specimens; later an ixocutis. 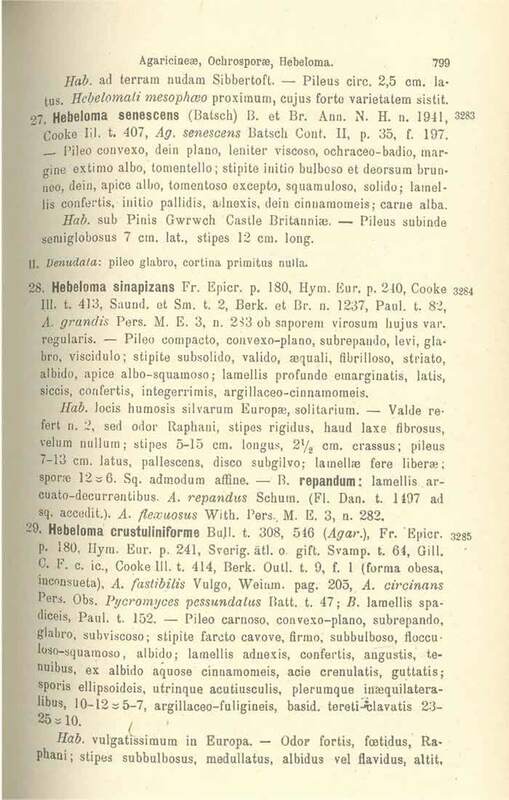 REFERENCES: (Paulet, 1793) Saccardo, 1887. (Fries, 1838; Smith, 1975; Smith, Smith & Weber, 1979; Smith, 1984; Weber & Smith, 1985; Arora, 1986; Vesterholt, 2005.) Herb. Kuo 10160304. I have based the description above on my collections and on Alexander Smith's 1984 description of a "North American variant" of Hebeloma sinapizans. For a contemporary account of the European Hebeloma sinapizans, which features ventricose cheilocystidia and does not feature droplets on its gills, see Vesterholt (2005).